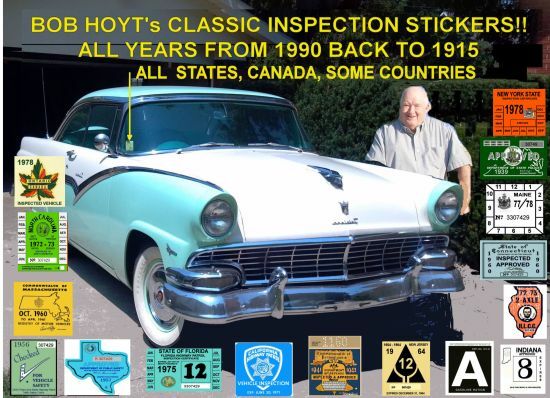 Bob Hoyts Classic Inspection Stickers, Add a Final Touch to your Restoration! CONGRATULATIONS!! You have found a web site that will allow you to purchase virtually any classic Inspection, Registration, Tax, Gas Ration or WW2 sticker issued in the United States from 1920 to 1989. We have some Canada and several foreign countries. We now have Auto Logo, Muscle car and Race track stickers from years gone by. Professional vintage stickers to finish off your classic restoration, under the hood stickers and door jamb decals. Over 3000 stickers in stock. 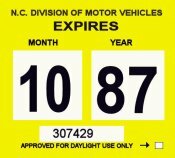 Our inspection stickers are reproduced nearly identical to the originals, both front and back, in size and color. They have our peel and stick format which allows the sticker to be placed on the inside window of your classic, (except some CA and Hawaii went outside). Custom designs are also available. Can't find it, We'll make it . We GUARANTEE your satisfaction ! To order with any credit card, register your name and address and create a password. Look for the stickers you want and add them to your cart. To check out, click on the PayPal button and watch for the drop down menu to use your favorite credit card OR You can choose to send a personal check. We are in church on Saturday to honor God's 4th Commandment to rest on the 7th day of the week. Our stickers are being sold by independant agents in Massachusetts, NJ, Texas, Pennsylvania, Illinois and Indiana. If you meet someone selling stickers at a car show be sure they are our stickers, there are some bad fakes out there especially in NY. Our reps will tell you if they are ours. Ask to see the backs. To see stickers for your state, or our logo stickers, racing tracks or WW2 selection, simply click on the state or folder and then the year you are interested in, it will come up and allow you to purchase the sticker with your credit card, Pay Pal or send check or money order. Our system uses PayPal because it is secure and safe. You do NOT need to have a PayPal account to make a purchase. To pay with your credit card, click on Pay Pal and follow the prompts. Send us a check or give us a call. Our phone lines are pretty busy but if you need to, leave us your number and we'll return your call shortly. Our instruction sheet will tell you where the sticker goes on your window. The fronts are replicas of the original. In some cases we use a generic back when we were unable to obtain the original. We do not show the backs of the stickers on this site to prevent stealing and copying images. WANTED: STICKER IMAGES NOT SHOWN ON THIS SITE. WE will pay CASH $10.00, for any original windshield inspection or registration sticker not appearing on this web site. PLUS provide you a free reproduction of the same sticker. Simply mail us an original in any condition. Or we will provide a free reproduction of your choice if you simply send us a good photo image of an inspection or registration sticker not appearing on this site. MUST DATE BEFORE 1992. We do not reproduce any stickers if they have a copyright insignia on them.